Why are Some Cocktails Made With Salt? In the cocktail world, salt isn't just for margaritas anymore. Many bartenders know that, just like a dash of bitters, a tiny bit of salt can balance a cocktail in a heartbeat. Bitters and salt do two different things: adding a bitter ingredient to a cocktail can make it seem less sweet, while salt makes bitter drinks taste less bitter. Campari falls into the category of bittersweet Italian liqueurs known as amari. Traditionally, an “amaro”—which translates into English as “bitter”—was used as an herbal medicine as well as an after dinner drink. Some amari, like the infamous Fernet Branca, were claimed to cure everything from dyspepsia to menstrual cramps. Many amari were developed by coffee shops to accompany espresso. This type of alcohol ranges from 16-40 percent ABV. Amari are made by macerating (the technical term for steeping) herbs in a neutral spirit or wine. Once that process is complete, the resulting infusion is filtered, sugar is added, and the product is either bottled immediately or aged in barrels first. Research suggests that the sodium (Na) part of the salt molecule (NaCl) is what suppresses bitterness. But the exact physiological or chemical effect is unknown. As a result, the other flavors seem more pronounced. This phenomenon works even at sub-threshold levels—that is, when you add so little salt that you can’t taste it. Thanks to this occurrence, salt has been called a “flavor enhancer,” but this can be a bit of a misnomer. In addition to its effect on bitterness, salt also heightens perception of aroma. Taste and smell are deeply linked, so being more able to smell something influences the tasting experience. Salt also causes an increase in saliva production, which can make a drink's texture seem more rich. For Campari, adding a bit of salt makes the liqueur seem less bitter. It also boosts the drinker’s ability to taste the citrusy sweetness and herbal notes that often get overwhelmed by bitterness. Instead of using salt granules, try making a simple salt tincture. 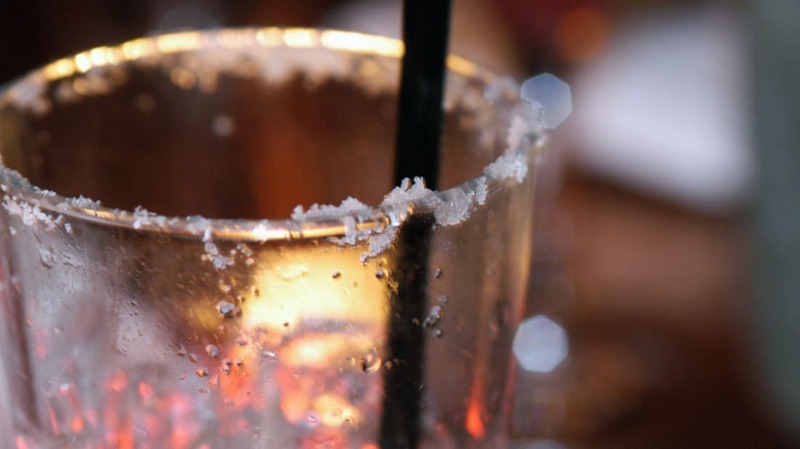 In liquid form, it’s easier to monitor how much salt you’re adding to a drink. The easiest and most accessible way to store and use this tincture is to save your old bitters bottles. Since droppers dispense the same size droplets almost every time, you can record exactly how much salt you prefer. To make the tincture, combine 1/8 tsp of pink Himalayan salt with 1 tbsp hot water. Stir until completely dissolved. Pour desired amount of Campari over ice. Add 2-3 drops of salt tincture. Stir and taste. If the mixture is still too bitter, add another drop or two, and continue experimenting until your drink is to your taste.